RootsTech 2019 is less than 30 days away and we can’t believe all the amazing offerings this year. 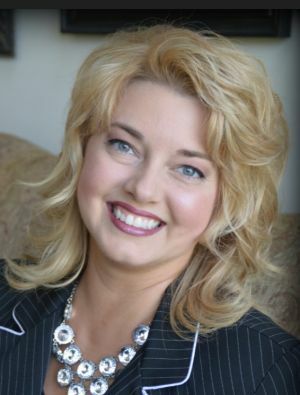 Over 300 genealogy and family history oriented classes, virtual passes, moving entertainment, and celebrity keynote speakers are just a few of the things attendees will enjoy. 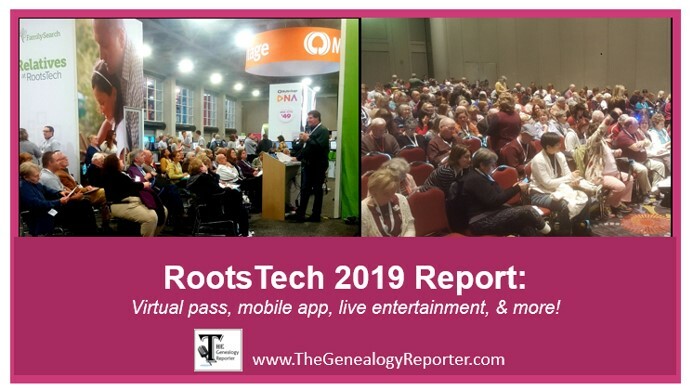 Read ahead to see all the news in this month’s RootsTech 2019 Report! Just take a look at the titles of all these fantastic sessions RootsTech 2019 has in store! Anyone will be hard-pressed to organize their days with all these great choices, but don’t fret. You can use the RootsTech Mobile App to manage your schedule, download your class syllabus material, take notes, and more! Learn all about the RootsTech Mobile App, here. In my opinion, the most exciting news thus far has been the announcement of the Virtual RootsTech Pass. Not all of us will be able to get out to Salt Lake City, but the RootsTech Team has put together a new virtual pass that includes access to 18 online recorded sessions from the conference. You can watch playbacks from your laptop, tablet, or smartphone device whenever and however you want! The virtual pass is perfect for any family historian or genealogist who is unable to travel or attend the conference in person. For those of you who are attending, attendees can add the virtual pass to their existing registration for just $79.00. To register, see the class titles available, or learn more about the Virtual RootsTech Pass, click here. Road to RootsTech Videos – Have You Seen Them All? It’s fun to keep up-to-date with all things RootsTech and this year it has been easier than ever to do so. The RootsTech team has been working hard to create videos on their “Road to RootsTech” series on YouTube. There are currently 10 episodes and they cover the ins and outs, ups and downs, conference swag, tips for travel, and all the hype behind RootsTech! Click on the video below and get the inside information on featured keynote speakers and entertainment at the conference. Speaking of featured keynote speakers and entertainment, have you heard who’s coming to RootsTech 2019? Here’s a look! Wednesday afternoon opens RootsTech 2019 with a speaker we all love and respect, Steve Rockwood, President and CEO of FamilySearch International. He is always a delight and inspires the audience to dig deep into our hearts and the lives of our ancestors. 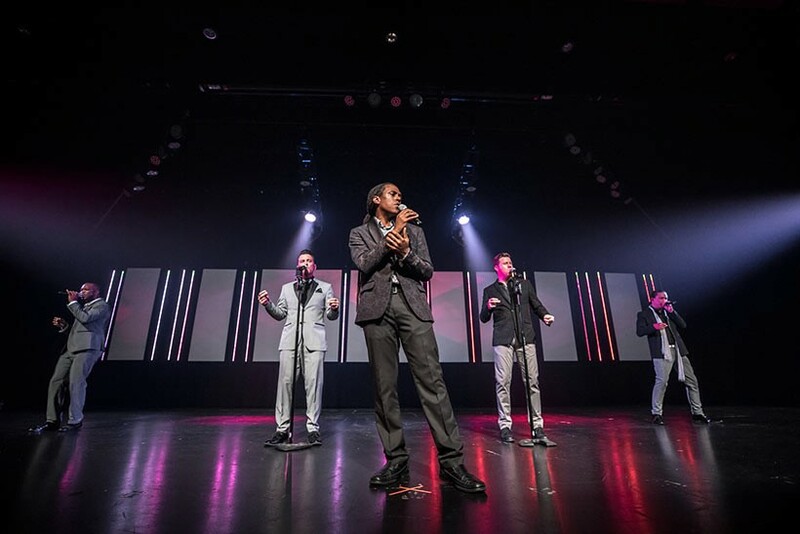 Also on stage with Steve, experience the contagious energy of the 5-part a cappella performance of The Edge Effect. Emmy award-winning actress Patricia Heaton will be the featured speaker on Thursday, February 28th. Get ready to watch one of the most recognized actresses in the world tell her story in person. She is a real-life wife and mother with 4 sons and she has a deep love and appreciation for family. Saroo Brierley is Friday’s keynote speaker and his story is sure to make the tears flow! Saroo lost contact with his family as a 5-year-old boy at a train station in India. He was later adopted and raised by an Australian family. But he was unable, and unwilling, to forget the land of his childhood. Determined to rediscover his past, Saroo pored over Google Earth and eventually managed to recognize his home town—and track down his birth mother. Their reunion in 2012 made headlines across the world, and his full story is recounted in his number 1 international bestselling autobiography, A Long Way Home. The last day of conference will not disappoint! Meet your friends at the main stage on Saturday, March 2nd to hear the melodious tunes and inspiring story of Jake Shimabukuro. At the age of 14, Jake realized he was doing something different with his ukulele. He had a unique approach to the fun instrument and his records have topped the Billboard World Music Charts on numerous occasions.